Kodály was a true polymath: an internationally recognized ethnomusicologist, pedagogue, linguist, philosopher and composer. He was born into a musical family but was more interested in literary studies as a young man. His father was a railway official and the family moved around the Austro-Hungarian Empire during his early years. In the 1890s he studied violin and piano and sang in the cathedral choir at Nagyszombat – an early introduction to choral music. He also taught himself the cello so he could play in his father’s amateur string quartet at popular house concerts. He began composing in middle school and the school orchestra played an overture he composed in 1897. A year later they performed his Mass for chorus and orchestra. He could be considered a bit of an overachiever: by his late twenties he had PHDs conferred in ethnomusicology, philosophy and modern linguistics. In 1907, after a period of study with Charles Widor in Paris, he became professor of music theory and composition at the Liszt Academy in Budapest. He was to teach at the prestigious school most of his life. While a student at the Liszt Academy Kodály met Béla Bartók this link should be embedded in ‘Bela Bartok’) (1881-1945) and the two became lifelong friends. Kodály introduced Bartók to methods of collecting the folk songs that were to influence both composers. In 1951, six years after Bartók’s death, their critical edition of Hungarian folk songs was finally published. 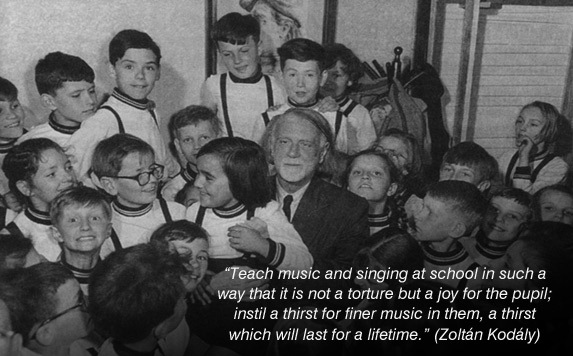 As an adult Kodály was concerned with music education and worked on a programme to reform the way music was taught in Hungarian schools. He wrote controversial articles, columns and essays in an attempt to raise awareness on the poor teaching methods in the system of the time. He insisted that music education needed to be taught in primary school and that trained teachers, a better curriculum, and more class time were needed. Colleagues, friends and students took his ideas and created what became known as the Kodály Method. https://en.wikipedia.org/wiki/Kod%C3%A1ly_method – same thing – this link should be embedded in ‘Kodaly Method’). It was adopted by Hungarian schools in the 1945 and is now an international method of music education. In 2016 the Kodály Method was recognized by UNESCO as an Intangible Cultural Heritage. Ernő Dohnányi dedicated two pieces to Kodály’s first wife Emma Gruber. She and the composer were married in 1910. A year after her death in 1958 Kodály married his 19-year-old student Sarolta Péczely. In the last eight years of his life he received several honorary degrees, was fêted at international festivals and conferences. He priemered his last work, Laudes Organi (In Praise of Organs), in 1966 one year before his death from a heart attack in Budapest.